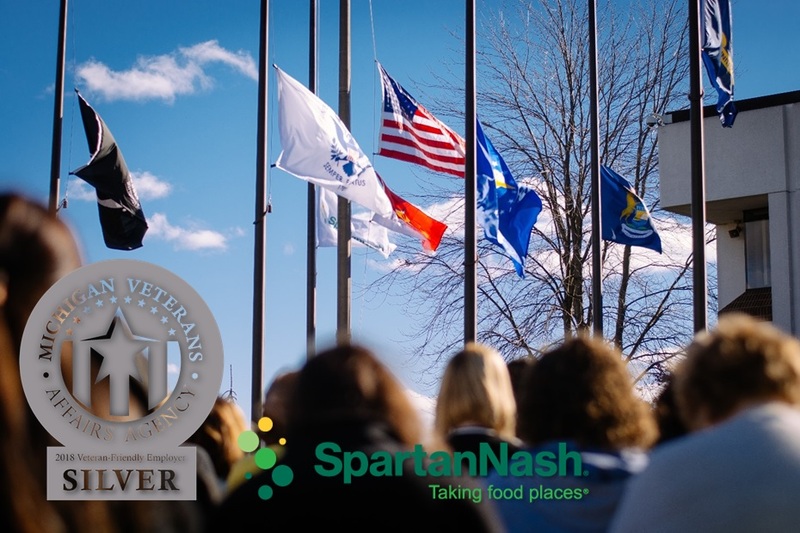 Grand Rapids, Mich. – For its efforts to hire, retain and recognize the vital role veterans play in its workforce, SpartanNash was recently named a Silver-Level Veteran-Friendly Employer by the Michigan Veterans Affairs Agency. As a leading distributor of grocery products to U.S. military commissaries and exchanges around the world, SpartanNash currently employs nearly 800 military veterans, in addition to Reservists, National Guardsmen and Blue and Gold Star family members throughout the company. At MDV, SpartanNash’s military division, 14 percent of associates are veterans or currently serve. For its veteran and military-affiliated associates, SpartanNash offers a military employee resource group, designed to enhance onboarding efforts and create a network for veterans to tap into for career support and training. In the past year, SpartanNash has also partnered with GI Jobs, the West Michigan Veterans Coalition, Michigan State University’s Student Veterans Association, the Minnesota Department of Employment and Economic Development Veterans Employment Services and Eagle Group – a Minnesota-based nonprofit organization that provides programs for servicemembers transitioning to civilian life – to expand its outreach and recruitment efforts of veterans and their family members. As a Silver-Level Veteran-Friendly Employer, SpartanNash also participates in MVAA’s Michigan Veteran Employment Council and Veterans Hiring Best Practices workshops to continue to improve its veteran recruitment, hiring, training and retaining efforts. In 2017, 6.4 percent of all SpartanNash hires across its corporate retail, distribution, military and food manufacturing business segments identified themselves as veterans. The company is also committed to supporting military heroes in their local communities, raising funds and awareness for a variety of nonprofit organizations that provide vital services to veterans and their families. Last year, SpartanNash’s corporate giving totaled more than $100,000 to 268 veterans initiatives and organizations. In 2017, the SpartanNash Foundation – the company’s charitable giving arm that aligns with 501(c)(3) organizations to provide hunger relief, secure shelter and support our military heroes – granted $122,500 to seven nonprofit organizations that provide veterans services. Among those who received grants were Fisher House Foundation, Vetshouse, Warriors at Ease, Hoosier Veterans Assistance Fund of Indiana, Inc. and Virginia Peninsula Food Bank. The Foundation’s scan campaign to support servicemembers, veterans and their families was its most successful companywide retail fundraising effort to date – raising an additional $300,000 on behalf of our patriotic partners Give an Hour™ and Honor and Remember®. Through the Veteran-Friendly Employer program, the Michigan Veterans Affairs Agency recognizes employers that commit to military veteran recruitment, training and retention practices by awarding those employers Gold, Silver and Bronze level status. MVAA’s Veteran-Friendly Employer program helps qualified organizations recruit and retain top veteran talent while providing others a road map to improve their recruitment efforts. SpartanNash was first recognized by MVAA in 2016, earning Bronze status for its commitment to veteran hiring practices and policies. For more information about SpartanNash’s veteran hiring practices – including available career opportunities – visit spartannash.com/careers.